Recent research found benefits in outcome outweighed any increase in hemorrhagic complications in patients with large infarcts. 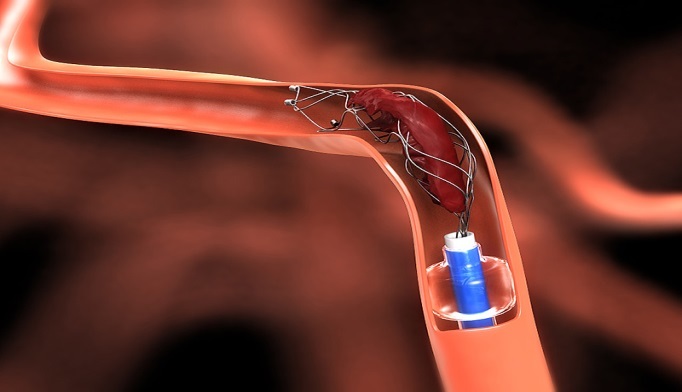 Since 2015, a multitude of randomized clinical trial evidence has vindicated the use of endovascular therapy over standard medical care for patients suffering from acute ischemic anterior circulation stroke and firmly established the use of stent retriever devices in a select population. At least 5 studies (MR CLEAN,1 SWIFT PRIME,2 ESCAPE,3 EXTEND IA,4 RESVASCAT5) have shown a benefit in outcomes with the use of early endovascular therapy with a pooled analysis (HERMES) of 1287 patients from 5 studies6 corroborating these positive results. Despite the overwhelming mountain of evidence supporting the use of endovascular therapy, there is a relative vacuum in the literature regarding its use in larger infarcts. All the previously mentioned studies excluded patients with larger strokes, most enrolling patients with an initial Alberta Stroke Program Early CT Score (ASPECTS) of 6 or greater. Among the 5 studies examined in the HERMES pooled analysis, variable results were reported in outcomes when stratified by ASPECTS 6-8 with a consistently less robust effect. MR CLEAN was the only study to evaluate patients with initial ASPECTS less than 6 and contributes a whopping 28 patients scoring less than 4. Of the studies that documented stroke volume, cutoffs for core infarct volume were as low as 50cc, with average infarct volumes around 6cc. In this landscape, Leticia C. Rebello, MD, of Emory University School of Medicine in Atlanta, Georgia, and colleagues, recently published evidence in JAMA Neurology that current criteria for endovascular therapy may be missing a significant population of acute stroke victims who could benefit from intervention.7 The researchers retrospectively investigated 56 patients in a case-control cohort and found a decrease in final infarct volumes, lower rates of hemicraniectomy, and an improvement in 90-day modified Rankin Score in patients aged less than 75 years with core infarcts greater than 50cc without an increase in hemorrhagic complications. A nonsignificant improvement in outcome was seen in patients with infarct volumes greater than 70cc with an overall trend favoring intervention. These results suggest that patients presenting with large perfusion mismatches, even in the context of large core infarcts, can still be treated safely and with a potential benefit with endovascular therapy. In an accompanying editorial,8 David Liebeskind, MD, of the Geffen School of Medicine at the University of California, Los Angeles, praised the investigators for expanding on relatively coarse imaging criteria from randomized trials and attempting to identify patients with large perfusion mismatches involving areas of eloquent brain tissue which are not easily captured in assessments such as the ASPECTS. The explicit and thoughtful focus on lesion topography is a step toward individualized care where “we tailor therapies to a variety of imaging patterns and underlying pathophysiologic findings in lieu of focusing solely on developing new therapies as one size fits all,” Dr Liebeskind wrote. The retrospective and case-control nature of the study is susceptible to bias, limiting its value in changing current practice. Overall, Dr Rebello and colleagues have brought an important clinical question to the forefront and can take credit for furthering our collective knowledge in the treatment of acute ischemic stroke. Data remains sparse on the treatment of large core infarcts with large perfusion mismatches. This study supports the notion that not all patients presenting with large core infarcts are doomed to poor outcomes and more rigorous investigation is warranted. Disclosures: Dr Nogueira reports research support from Stryker Neurovascular, Covidien, and Penumbra. Dr Liebeskind serves as a consultant for Stryker and Medtronic, and is employed by the University of California, which holds a patent for a retriever device for stroke. Berkhemer OA, Fransen PSS, Beumer D, et al. A randomized trial of intraarterial treatment for acute ischemic stroke. New Engl J Med. 2015;372(1):11-20. doi:10.1056/NEJMoa1411587. Saver JL, Goyal M, Bonafe A, et al. Stent-retriever thrombectomy after intravenous t-PA vs t-PA alone in stroke. N Engl J Med. 2015;372(24):2285-2295. doi:10.1056/NEJMoa1415061. Goyal M, Demchuk AM, Menon BK, et al. Randomized assessment of rapid endovascular treatment of ischemic stroke. N Engl J Med. 2015;372(11):1019-1030. doi:10.1056/NEJMoa1414905. Campbell BC V, Mitchell PJ, Kleinig TJ, et al. Endovascular therapy for ischemic stroke with perfusion-imaging selection. N Engl J Med. 2015;372(11):1009-1018. doi:10.1056/NEJMoa1414792. Jovin TG, Chamorro A, Cobo E, et al. Thrombectomy within 8 hours after symptom onset in ischemic stroke. N Engl J Med. 2015;372(24):1-11. doi:10.1056/NEJMoa1503780. Goyal M, Menon BK, Van Zwam WH, et al. Endovascular thrombectomy after large-vessel ischaemic stroke: A meta-analysis of individual patient data from five randomised trials. Lancet. 2016;387(10029):1723-1731. doi:10.1016/S0140-6736(16)00163-X. Rebello LC, Bouslama M, Haussen DC, et al. Endovascular treatment for patients with acute stroke who have a large ischemic core and large mismatch imaging profile. JAMA Neurol. 2016;30303:1-7. doi:10.1001/jamaneurol.2016.3954. Liebeskind DS. Lesion size and perspective in acute ischemic stroke. JAMA Neurol. 2016;c:1-2. doi:10.1001/jamaneurol.2016.4275. Koroshetz WJ. Tissue plasminogen activator for acute ischemic stroke. N Engl J Med. 1996;334(21):1405-1406. doi:10.1056/NEJM199605233342114. Lansberg MG, Thijs VN, Hamilton S, et al. Evaluation of the clinical-diffusion and perfusion-diffusion mismatch models in DEFUSE. Stroke. 2007;38(6):1826-1830. doi:10.1161/STROKEAHA.106.480145. Jauch EC, Saver JL, Adams HP, et al. Guidelines for the early management of patients with acute ischemic stroke: A guideline for healthcare professionals from the American Heart Association/American Stroke Association. Stroke. 2013;44(3):870-947. doi:10.1161/STR.0b013e318284056a.